My niece’s first birthday is next month, and I had decided to knit her a sweater made from my handspun. Because my sister knows how to take care of nice things, I decided that I wasn’t restricted to just superwash fibers. 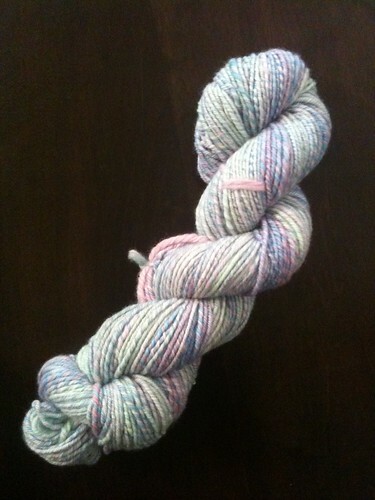 I selected the organic merino I got in the Spunky Eclectic club in March 2011; the colorway is Little Periwinkles, which is pastels — pink, blue, green, purple with some white. For the pattern, I choose Elizabeth Zimmerman’s February Baby Sweater from The Knitting Almanac. It’s pretty much seamless, with some lace to make it pretty. I started by spinning up 4 oz, which gave me approximately 194 yards of light worsted yarn. I used about 30 yards knitting a swatch to determine which needle size would be best for the yarn and get me the closest to the gauge listed in the pattern (5 sts/inch). I tested out size 5, 6, and 7 needles. 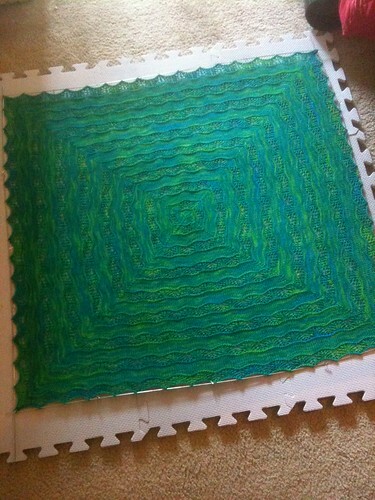 It was hard waiting for the swatch to dry, but in the end it told me that I could get 5 sts/inch on size 6 needles. However, I liked the fabric from the size 7 needles better, and the gauge was only 4.8 sts/inch; close enough, and would allow me to err on the bigger size for the sweater since Miss M is growing quickly. Unfortunately, the 160-ish yards I had left were not enough to complete the sweater. I got through the yoke, the arm separation, and about 3 inches of the body before I ran out. So, it’s back to the spinning wheel for me to get more yarn for finishing up. I’ve gotten the 4 bobbins of singles done and am just waiting for them to rest a little before getting the plying started. 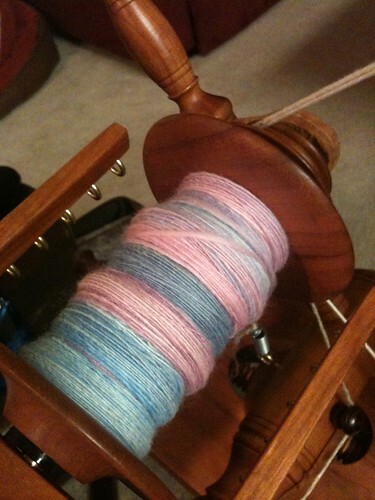 I must say, the organic merino is a dream to spin. 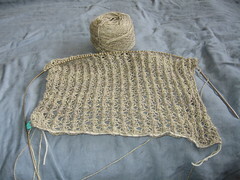 I have more of it in different colors from Spunky Eclectic and am now looking forward to spinning and knitting it up. So soft. After I finished the Rivendell socks, I was a bit listless over what to knit next. 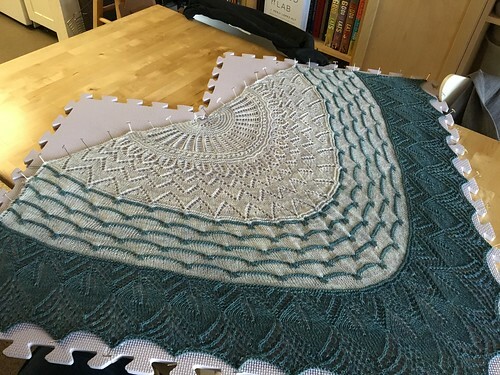 I had bought some Mountain Lace in a nice navy blue that I want to make Aeolian out of, but the idea just wasn’t getting me excited. 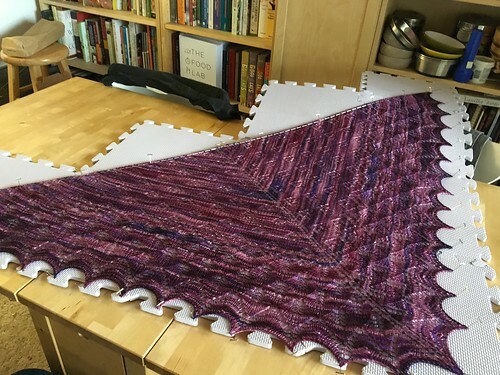 I kept thinking I wanted to knit something out of some of my handspun. I hadn’t done that in some time. 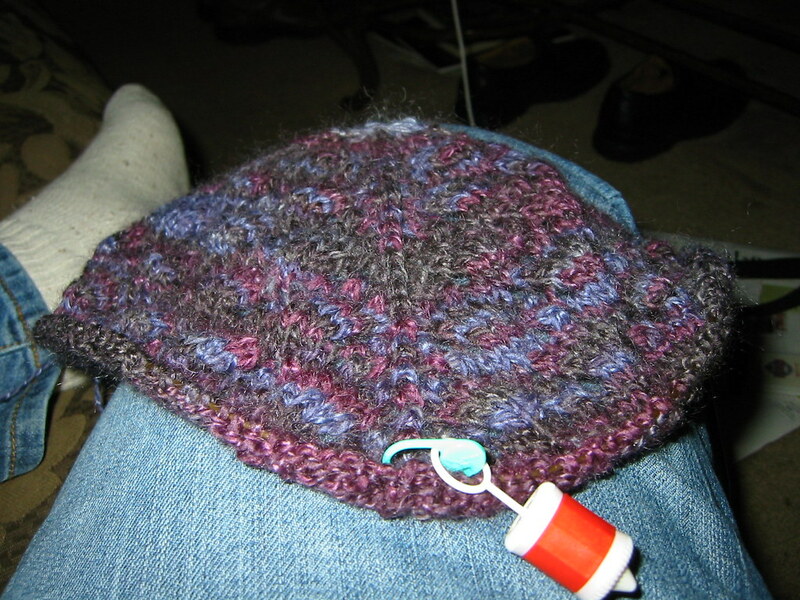 There’s something really nice about knitting with yarn that you’ve spun yourself. I had managed to get my hands of some Spunky Ecelectic Corripaca before Amy ran out of it several months ago. 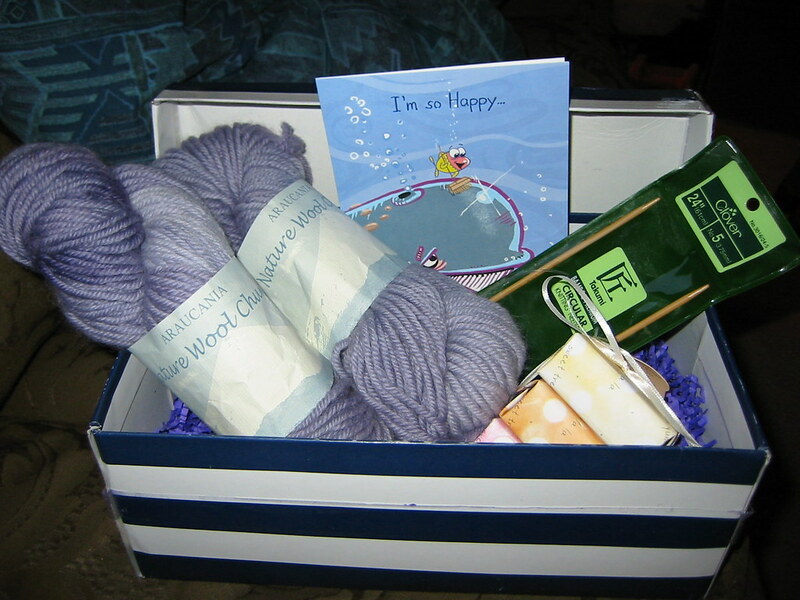 The colorway I chose was Estuary, which was a pretty mix of green, brown, and natural. 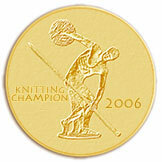 I spun it up as a 2-ply lacewight getting approximately 509 yds out of the 4 oz. 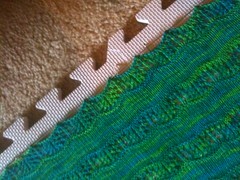 I thought with the brown and greens the perfect pattern would be Laminaria. So, I cast it on last Thursday. I’ve gotten through the star chart and have completed the first repeat of the blossom chart. So far, I love the way the colors are stripping up. I think with the edging it will really look seaweedy. I should also say thanks to BigAlice and Sandy for their comments on my last post. Since they’ve given me permission to whinge, here it is, in all its silly glory…. First off, I’m an introvert; being around people can be tiring, but that doesn’t mean that I don’t like to be social. Things in my life got a lot better when I accepted the fact that I am an introvert, that I’ll never be an extrovert, and I learned what I needed to do for myself. However, knowing and accepting don’t always help when I go through periods of profound loneliness. I lament that I don’t have many close friends; I pity myself for not being invited out to do things. It leaves me feeling like there’s a hole in my gut for a few days, then it passes. I have to remember that I probably don’t present myself as someone who is interested in going out and doing things, and frankly, I’m not sure how to even give that impression. I don’t know how to make instant friends with people, and I have only a slim number of lasting friendships. I’m not looking for a pity party, but just explaining where my head was earlier this week. I’m hoping maybe by putting some of it into words I’ll get a better grasp on what it is that bothers me. Now, on a lighter note… YARN!